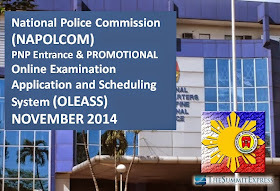 The National Police Commission (NAPOLCOM) announces the schedule of Online Examination Application and Scheduling System (OLEASS) for November 9, 2014 NAPOLCOM PNP Entrance and Promotional Exam. The online scheduling system for Entrance Exam will be activated on Monday, August 11, 2014 at 12nn. For the Promotional exam, system will go live from August 18, 2014 at 12 in the afternoon. Scheduling system for PNP Entrance and Promotional Examination is open up to the specified date below. However, NAPOLCOM limits the number of applicants on 'first-come, first-served' basis and upon due notice, may be stopped even ahead of the deadline. Update: NAPOLCOM OLEASS for November 2014 exam is now available here. Note: The link for the Online Scheduling System will be activated here. Please check back for the update. The NAPOLCOM utilizes the OLEASS for the scheduling of the filing of applications for the PNP Entrance and Promotional Examinations. NAPOLCOM advised that only applicants with a confirmed scheduled appointment with reference number shall be entertained. PNP Entrance exam is open to all Filipino citizens who are not more than 30 years old, bachelor's degree holder with 1.57 (female) and 1.62 (male) meters in height. On the other hand, promotional exam is open exclusively to all qualified uniformed members of PNP who meet the minimum qualifications standards for examination in terms of rank and eligibility.